Good morning politicos, here’s the buzz. PoliticsPA takes a look at Obama’s PA primary performance and found some problems for him in Western PA, Romney’s tour through PA had highs and a big low, and the GOP selected State Rep. Vulakovich to run for ex-Sen. Jane Orie’s seat. Obama’s WV Problem Stretches Into PA: With maps: A significant portion of western and central PA Democrats declined to vote for Barack Obama in the primary, an analysis by PoliticsPA has found. The results there resemble those of Kentucky and West Virginia, where he lost around 40 percent of the primary vote to no-name opponents or “undecided”. Romney Talks Up PA Chances to Friendly Lebanon Crowd: Mitt Romney and PA’s leading Republicans talked up his chances of winning the state during a rally Saturday. “I AM gonna win Pennsylvania!” Romney declared to a crowd of about 700 supporters in Lebanon County. Gov. Tom Corbett, Sen. Pat Toomey and several others joined him. GOP Picks Vulakovich Over Hart for Orie Seat Special: State Rep. Randy Vulakovich will likely soon be State Sen. Randy Vulakovich. GOP party leaders named him as their candidate for the seat of ex-Senator Jane Orie, who was convicted over ethics violations earlier this year. Smith Seizes on Prez’s Casey Comments, But is Obama a Liability? (Watch Video): Barack Obama gave Bob Casey the kind of praise on Tuesday that would have given a Dem candidate heartburn in 2010. Among other accolades the President said Casey, “has always had my back.” Naturally, Tom Smith jumped on the comment. But is Obama, who polls ahead in PA, really a liability for Casey? 6/15 Ups & Downs: See who had a good week, and who would like to take it back. Campaigns are heating up around the state. 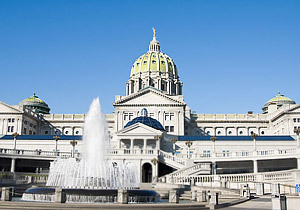 Plus, it’s been busy in Harrisburg, and it looks like one politico could use a stiff drink. Update: PA Dems Blast Romney; Nutter Emerges as Top Surrogate: With a cross-state Romney tour looming, PA Dems have sounded the alarm bells. Rendell and some other prominent Dems plan to meet up with Romney at a Quakertown Wawa, as Mayor Nutter and VP Biden discuss why America needs four more years of Obama. Marino Challenger Agrees with Bush: Democratic businessman Phil Scollo, who’s running for Congress in Pennsylvania’s 10th District, wants supporters to know he agrees with Bush. Jeb Bush, that is. SD-40: The GOP has named State Rep. Randy Vulakovich as their candidate for ex-Sen. Jane Orie’s seat. He will face Dr. Sharon Brown in an Aug. 7 special election. WFMZ: Mitt Romney visits area, makes 1st stop in Carbon Co.
Harrisburg Patriot-News: Could the lottery be privatized? Harrisburg Patriot-News: Editorial: Are the days of early state budgets over? Pottstown Mercury: Can Obama run on his record? PA Water Cooler: Republicans throw up roadblocks to property tax reform-where is the outrage?